Emma has been involved in Awana this year. Growing up, I had never heard of Awana, but it's pretty popular around here. Awana is kinda like church youth group for younger kids. They memorize Bible verses, play games, and earn patches for their vests. Emma loves it. Last night was the Awana fair. We brought the whole family for some good old-fashioned carnival fun. When we first pulled into the parking lot, we saw a train for taking the kids around the parking lot. The boys went crazy. "De twain! De twain! Gwant wanna go de twain!" It was very difficult to keep hold of their hands and drag them inside to check in. We headed into the gym, where they had games set up. There was a huge bouncy castle, and Grant started screaming. What is more terrifying to a two year old than the thought of having fun and jumping? Not much, it seems. We got checked in and decided to leave the area that was creating the tear-filled "No bouncy! No castle! Gwant no wanna bouncy!" We headed back outside to start at the train. The boys practically dragged us to the train, and waited excitedly for it to return from it's current trip. Grant chattered excitedly, his little voice rising and falling like a seasoned storyteller. "Gwant go de twain! De twain, twain, twain, no bouncy, de twain, no castle, castle bouncy no, go de twain." Ben, in his soft little voice, "Bens tain? Tain?" Anyone who knows the boys knows the typical exchange. Grant talking a mile a minute, just like his sister, and Ben, not competing, but occasionally getting a word in edgewise in his little tiny voice. The train arrived, and the boys were literally jumping up and down with excitement. As soon as it was time, they ran up and attempted to climb into the cars themselves. There was one car the held two kids, most only held one, so we put the twins in there. There they sat, brows furrowed in concentration, holding the little play steering wheels and taking it all in as if they were on their first ride at Disneyland. You could almost feel the excitement coming out of them. The train got ready to start, and let out a little "ding!ding!" They looked up in surprise. This thing moves? The train started to move. The excitement faded a little, as they suddenly realized that they were not going to just sit there and play. They were moving. On a train. As the train passed us and went on it's course, Ben turned to look at us. Sheer terror filled his little face as he tried to lean out of the train car, screaming, "Momma! Momma!" and sobbing. We chased the train down and had the driver stop. Marty asked Grant, "do you like the train?" Grant responded with a little, unsure, "yes?" We rescued Ben and walked away, letting the other kids enjoy the ride. It is interesting how one little boy can be so brave with his twin brother next to him, and how quickly that bravery fades when brother is gone. The train pulled away for the second time, and Grant started crying. By this time, I have Drew in the front pack, my camera over my shoulder, and Ben on my hip, face buried into my shoulder, crying, "Momma, no tain, no tain!" The train was too far away to chase down again, so we waited for it's return. As it came around the corner, I kinda got the feeling that Grant had stopped crying and just started up again when he saw us. We saved Grant, collected Emma, who thoroughly enjoyed the whole thing, and headed back inside. Luckily, there were two rooms with games, one with a bouncy house and one without. We took our still sobbing boys to the one without. They quickly forgot their trauma as the possibility of games intrigued them. By this time, Drew was passed out from all the excitement, and I was trying to not lean too far to one side or the other in order to keep his head from flopping all around. I have to say, it was a little difficult to keep his head level while trying to keep ahold of one two year old, keep track of a four year old, and take pictures of Marty and the other boy who was tossing rings/throwing beanbags/fishing. Ben and Emma wanted to go in the bouncy house, so we went in there for awhile. 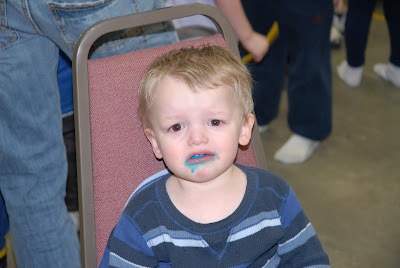 We stood in line and all the while, Grant is softly crying, "No bouncy castle. No castle. No castle, bouncy, bouncy, bouncy castle, no no twain." We tried to assure him that he did not have to go in, but he was very wary for a while. Emma and Ben went in, and Grant stayed out, still muttering to himself. There comes a time at every carnival that you know you are done. When all the fun available has been had, when all the candy has been eaten, and it's time to go home. How do you know when you have hit that point? Trust me, you just know. All the way home, Grant muttered in his story-telling voice, "No twain, no bouncy, no castle." Going into the house. "No bouncy castle, twain, no twain." In the house, telling his cars about the adventure. "No castle, castle, bouncy castle, no twain." "Grant, did you have fun?" A big smile spread across his face, and he enthusiastically replied, "YES!!" Good. We won't need as much money saved up for therapy after all. That pic of poor little Ben is priceless! Wish I could have come! OH the point of meltdown, I know it well! We usually try to leave pre-meltdown but anticipating when that will be isn't an exact science.